If you’ve ever been to Kauai then you know there are thousands of chickens running around. You find them in the most remote places like deep in the jungle. And you find them in parking lots. They are everywhere. We have about 10 hens, 2 roosters and a family that come into our yard regularly. There are a lot more around the neighborhood, keeping Dan awake at night and in the early mornings. Baxter has a new job, to chase the chickens out of the yard. 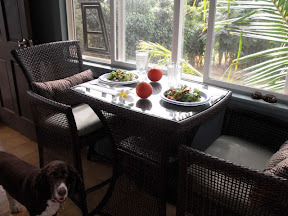 Our neighbors initiated this (and being good neighbors) we have been training him. Given their bad luck of having the crazy chicken lady as a neighbor and being so kind to us our first night, it’s the least we can do! He takes his job very seriously; always on the lookout, he sits on the landing intently looking through the railing. Watching, sniffing. Lucy enjoys chasing them too, but usually, she takes to long to notice they are there and by the time she notices, Baxter has chased them away. Today we are being lazy. It’s a grey day, lightly raining. 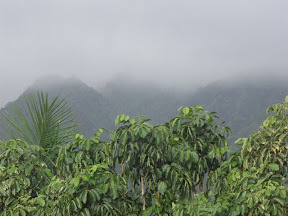 The misty clouds cover the mountaintops and we have to put on long sleeves. At the kitchen window, I see some chickens. I take Baxter outside and say “go get em”! There is a bend in the yard so he can’t see them. He runs down the stairs anyway and does a cursory pass for me, and comes right back up. I take him down and try to point them out but he is fixed on a different area. I walk over to where they were but they have gone into the next yard. Peeking through the tree hedge, I find the chickens. There are actually 2 rows of hedges, one on our side, a 4-foot space then the other hedge, making a sort of tree tunnel. Baxter comes over to look at what I’m looking at and sees the chickens. He’s gone, scaring the chickens every which way, he doesn’t bark at them but they are squawking like crazy. 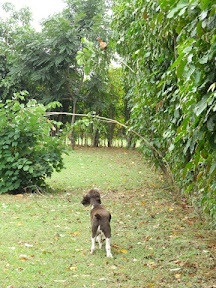 A hen runs into our yard where Lucy is, and she chases the hen until it flies into a tree making up the hedge. Her weight is bending the branch so she is easy to spot. This strikes me as hilarious and I start laughing out loud. That chicken thought it got away from Baxter only to run into Lucy! It’s up in the tree driving Baxter crazy, he wants it but he can’t get it. I finally bring him inside to calm down. The only other excitement we had today is we ate our delicious, locally grown, organic produce, and loved it! 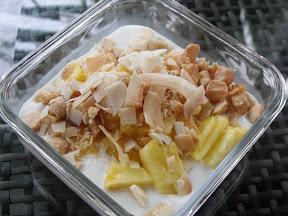 Vanilla yogurt, pineapple, macadamia nuts and toasted coconut. Yum! A delicious salad of avacado, tomato, cucumber, lettuce, macadamia nuts, and basil tossed in a lemon and Temecula olive oil vinagrette. Tangelos for desert and a plumera flower just cuz.